IBM today released its mobile software/portfolio which will combine security, analytics and app developments again with cloud based service for enhancing business as well as social supporting services. Today's smartphone industry is taking more and more people to shift from laptops and computers to small handy big screen tablets and phablet. So why software industry stay behind. 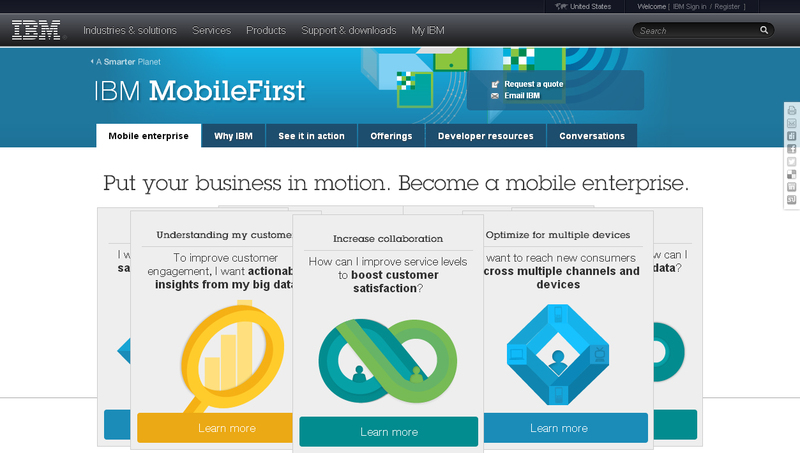 That's exactly IBM trying to play with their ongoing efforts "MobileFirst". IBM MobileFirst Solutions can work flawlessly to build entire business model in efficient way than ever before. This provides essential tools to understand and expand business by taking help from today’s' mobile world. To get full advantage of MobileFirst solutions customers must use mobile strategy, cloud, big data, social business and security. So right from helping community saving from natural disasters, alerts, collecting data for saving from mishaps to expanding business in efficient way, MobileFirst can handle everything. MobileFirst will try working parallel with other major mobile operating systems to cope up with client's needs and variety of database to provide accurate results. It is simply IBM's initiative with mobile technology helping towards business process, security and data analysis in most efficient way. With variety of mobile operating systems and UI's, IBM have taken challenge towards this new strategy called "MobileFirst"
A Broad Portfolio of Mobile Solutions- This will have specific apps to support all type of database including management, social, back end technologies, security services etc. MobileFirst platform will help customers to enable access to variety of specific apps at the same time. It will also provide enough security to ensure data safety. MobileFirst Analytics will study the overall mobile behavior and provide scope for further updates and needs. MobileFirst will be open for Developers, Academics as well as Business Partners. With as many as 10 mobile related acquisitions, nearly 1000 customer involved, 270 patents in wireless technology, IBM developing this solutions to business management, mobile network, social database, safety, infrastructure and applications.